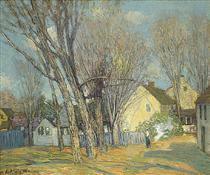 Julian Alden Weir (August 30, 1852 – December 8, 1919) was an American impressionist painter and member of the Cos Cob Art Colony near Greenwich, Connecticut. 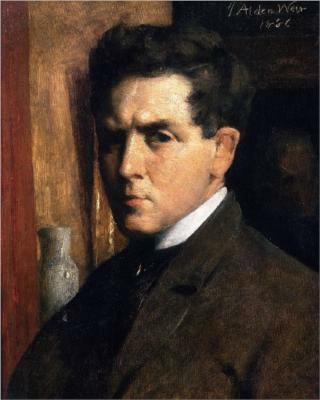 Weir was also one of the founding members of "The Ten", a loosely allied group of American artists dissatisfied with professional art organizations, who banded together in 1898 to exhibit their works as a stylistically unified group. 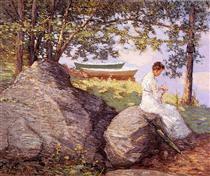 Weir was born on August 30, 1852, the second to last of sixteen children, and raised in West Point, New York. 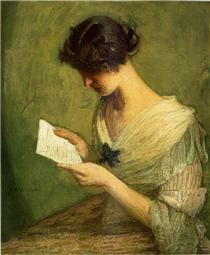 His father was painter Robert Walter Weir, a professor of drawing at the Military Academy at West Point who taught such artists as James Abbott McNeill Whistler. 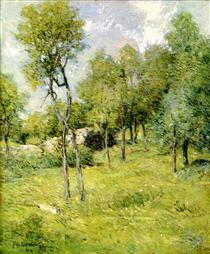 His older brother, John Ferguson Weir, also became a well-known landscape artist who painted in the styles of the Hudson River and Barbizon schools. He was professor of painting and design at Yale University from 1869, starting the first academic art program on an American campus. Julian Weir received his first art training at the National Academy of Design in the early 1870s before enrolling at the École des Beaux-Arts in Paris in 1873. While in France he studied under the famous French artist Jean-Léon Gérôme, and became good friends with Jules Bastien-Lepage. 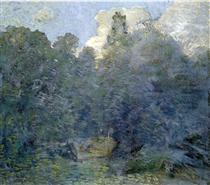 Weir also encountered impressionism for the first time, and reacted strongly: "I never in my life saw more horrible things...They do not observe drawing nor form but give you an impression of what they call nature. It was worse than the Chamber of Horrors." 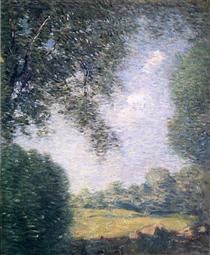 He complained about the Impressionists in a letter from April 15, 1877 to his parents saying, "They do not observe drawing nor form but give you an impression of what they call nature". 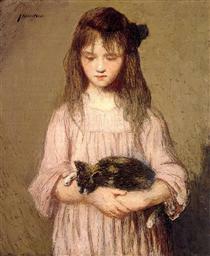 As a conservative academic painter at this stage in his career, Weir was esteemed by his European peers during his training years. 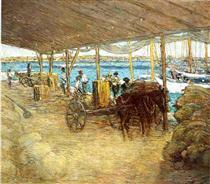 Weir met James McNeill Whistler in London before returning to New York City in 1877. 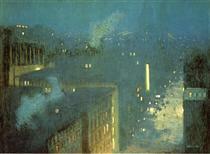 Upon his return to NYC, Weir became a charter member of the Society of American Artists and continued exhibiting his work at the National Academy of Design, where he first displayed his paintings in 1875. 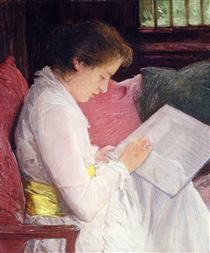 He earned wages through portrait commissions and teaching art classes at the Cooper Union Women’s Art School, the Art Students League and in private classes. His works as a young artist centered on still life and the human figure, which he rendered in a realist style not unlike the work of Édouard Manet. 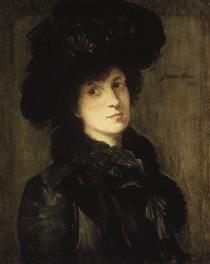 This was supported by the fact that Weir purchased two paintings by Manet during the summers of 1880 and 1881, Woman with a Parrot and Boy with a Sword, for the New York collector Erwin Davis. 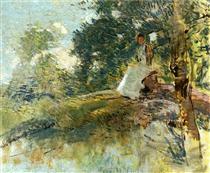 It was clear by then that Weir was beginning to lose his previous staunch loathing for French Impressionism. 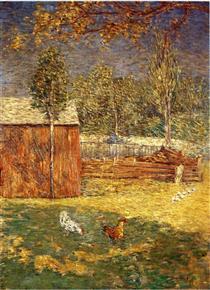 In the 1880s Weir moved to rural Ridgefield, Connecticut after having acquired farm property, now the Weir Farm National Historic Site, through his marriage to Anna Baker in 1883. 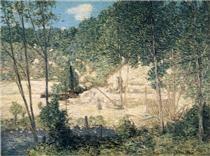 While here, he strengthened his friendship with artists Albert Pinkham Ryder and John Henry Twachtman. 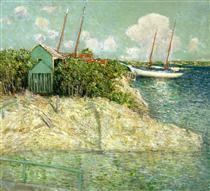 The art of Weir and Twachtman was especially well aligned, and the two sometimes painted and exhibited together. Both taught at the Art Students League. 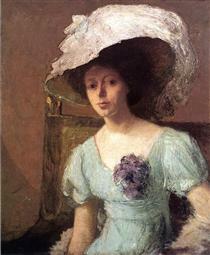 In 1889, the two artists exhibited and sold a large portion of their paintings at Ortgies Gallery in New York. 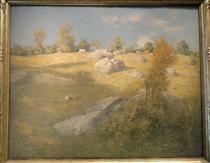 Weir was also close friends with the still life and landscape painter Emil Carlsen who summered with Weir on his farm, before purchasing his own home in Falls Village, Connecticut. 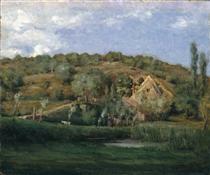 The pastoral setting of his farms often feature in his paintings. They were a healthy escape from the hustle and bustle of urban New York City. Weir loved working in the city, but it often became too much for him to bear. Branchville and Windham served as comfortable getaways. According to art historian Hollis Clayson, "Life on the street could often frustrate and aggravate, but contemplated from far off, experienced exclusively as a visual phenomenon, it could satisfy". 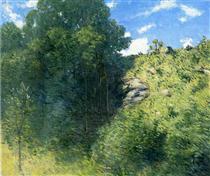 Landscape with Seated Figure Julian Alden Weir ?